If you haven’t already read them, check out my first and second trimester blog posts. My third trimester felt like it rolled around super quickly! I’ve loved having an obvious bump and gradually winding down from work as my immerse myself in self care, preparation for birth and the arrival of our little dude. I’m booked in to give birth at the Family Birth Centre in Subiaco which is a midwife lead centre that is attached to King Edward Memorial Hospital. We chose the birth centre as I’d like to have a drug free natural birth in a relaxed environment. I also feel extra safe knowing that if there are any issues before, during, or after the birth of our bub, I can easily be transferred to the hospital while still remaining in midwife care alongside OB. When it comes to choosing where you want to give birth, its a super personal decision and it’s a good idea to do your research even before you start trying to conceive in case you need to adjust your insurance cover or book in early to get your preference. I’ve loved my experience at the birth centre because I feel really empowered by their passion for natural and intervention free birth which I have always been intuitively drawn to. Birth centres in general have the the lowest rate of Cesarean sections compared to public and private hospitals - you’re 70% less likely to have a Cesarean in a birth centre than a private hospital. The support from the birth centre has been amazing - from 16 weeks onwards they offer 24/7 phone support so you can call any time with questions or concerns which is great, especially as a first time mama there are plenty of surprises in pregnancy like ligament pain, changes in baby’s movements and random questions that pop up. At 27 weeks a blood test came back saying I was anemic so I started iron supplements. Red meat was not something I’d been feeling like or tend to eat much of in general - I just don’t crave it. To increase my iron levels I introduced more red meat (always organic and grass fed) as well as green smoothies, red kidney beans, spinach, eggs, and chicken to my diet. At 36 weeks a blood test showed my levels had increased which was a relief (if they’re too low you’re not allowed to birth at the birth centre and get transferred to the hospital). Next pregnancy I’ll probably start taking supplements and focusing on an iron rich diet earlier on so I don’t get so tired towards the end of my second trimester! As well as these adjustments, from 36 weeks I’ve also been drinking a cup of raspberry leaf tea and eating 6-8 dates per day. Raspberry leaf tea is said to ‘tone’ the uterine muscles in preparation for birth and some really interesting studies have found that women who consume medjoul dates in the last four weeks of pregnancy are less likely to need to be induced (i.e more likely to go into labour naturally before 42 weeks gestation), more likely to deliver vaginally, and are more dialated when admitted to hospital than women who didn’t eat dates. Another study found that, when dates are eaten soon after birth, the women experience less blood loss. I’ve been adding dates to smoothies and porridge and made this yummy slice to make eating them a bit more interesting! I’ve also learned some great breathing and relaxation techniques from the course and found it really helpful for planning for labour and writing our birth preferences. It’s also been really great for Trav too as they teach a range of ways partners can support the birth process. We’ve also attended birth, breastfeeding and early parenting classes through the Family Birth Centre which have been really informative and fun - it’s a 4 part series with a class on labour, birth, early parenting and breastfeeding. They also hold morning teas where you get to meet new mums and dads and their bubs and hear about their experience and also meet the other midwives who could be present at your birth. I know most maternity hospitals and birth centres offer classes like these and I’d definitely recommend going along. A TENS machine is a battery operated machine for managing labour pain - it’s attached to 4 electrode pads that you place on your mid and lower back that disrupt the pain signals to the brain caused by contractions. It’s completely safe and a drug free alternative to managing labour pain. Most maternity hospitals run free classes and I’m really glad I went along - we tried out the machines on our arms and got an idea of how it feels and how to use them during labour. You can buy them or hire them - wherever you’re giving birth will be able to tell you the best option. I’ll definitely be giving it a go! The Spinning Babies Daily Essentials video has been another great resource - it’s a guided set of stretches plus tips and daily activity recommendations that are all aimed at preparing the body for birth and encouraging bub to get into an optimal position. I first started these at about 32 weeks when our bub was breech and he turned head down shortly after (yay!). I can’t say for sure the spinning babies stretches are what made him move but it’s a lovely gentle routine to get into whatever position your baby is in. I also found the tips for sleeping and moving in general really helpful! As I’ve prepared for birth, I’ve found my intuition to be my best guide - while some resources instantly felt right, others didn’t. Let your gut be your guide - if a certain approach, book, or podcast piques your interest, follow that! If not, then leave it. At the end of the day, there is SO much information out there that it can get overwhelming so it’s best to stick to what resonates with you and trust that you’ll learn what YOU need to learn to have the birth you need to have. As part of the Positive Birth Co. Course, you get access to the private Facebook group where women share their birth stories which I’ve loved reading! I’ve also loved talking to my friends about their births - I find that hearing recent birth stories first hand is always empowering, even when things didn’t go 100% to plan. Something to watch out for is people who want to tell you birth horror stories that happened to a friend of a friend (why people feel the need to share this with a pregnant women, I don’t know!). If I could tell someone was about to launch into one of these, I’d quickly let them know that unless it’s a positive story I would rather not hear it, and quickly chnage the subject. We were also advised not to watch TV shows like One Born Every Minute as they usually show births where something dramatic happens and then it’s edited to build suspense and drama - no thanks! It’s not about burying your head in the sand - in our birth classes we’ve talked about things that can go wrong before, during or after birth and we know our options if things don’t go to plan but it’s nice to talk about it calmly, and not in the context of a dramatic story! This book has a nice stretching routine and is a great introduction to taking an active and natural approach to birth. This book covers lots of practical skills for coping with labour pain and lots of positive birth stories from women and thier birth partners. Some of the birth skills do sound a bit weird (banging stress balls together anyone?) but I’m up for trying anything if it makes labour more manageable! There are a heap of books around on newborns and I chose the first 6 weeks because I’d heard midwife Cath on a couple of podcasts and liked her practical approach to caring for both baby and the new family unit. We’ll see how well it works for us but I feel prepared and glad to have a single guiding voice rather than too many competing ideas of what to do when bub arrives. I got an extra copy for my parents and mother in law to read as well so they have an idea of our approach and how they can help out. Baby Centre - I’ve been using the Baby Centre to app my pregnancy from the beginning and it’s been great - as well as weekly updates on baby’s development, the app has lots of useful articles all the life changes that come along with pregnancy. Freya - this app is created by the Positive Birth Company and has a some relaxing audios and meditations as well as a surge (a.k.a. contraction) timer for when labour arrives. I’ve loved it for relaxation in the evenings. Red Nose Safe Sleeping - our midwife reccomended this app - it’s very simple and easy to use and goes through safe sleeping and wrapping for bub and other SIDS prevention tips. About halfway through my pregnancy I made up some birth affirmations cards - I used our hypnobirthing course, Instagram and Pinterest for inspiration and created my own affirmations. I stuck these affirmations on my bedroom mirror and I read them every morning and evening - a nice way to get in a good mindset for birth! If you’d like to see my affirmation cards, check them out on my Instagram @amelia_harvey_ under the ‘Pregnancy’ highlight. The Positive Birth Co. hypnobirthing course also comes with a recording of positive birth affirmations set to relaxing music which I listened to regularly. At about 32 weeks I was diagnosed with a mild case of pubic symphysis (a.k.a pelvic girdle pain) which is where the ligaments of the pelvis get a little too stretchy and I’d feel pain at the front of my pelvis when doing any single leg exercises, getting out of the car and rolling over in bed. It hasn’t been a huge inconvenience - I’ve still been able to do gentle home workouts and I’ve been swimming or pool walking every day since 28 weeks (it’s heaven to be in the water and feel weightless!). Now that I’m in the later weeks of pregnancy I’m loving bounding on the fit ball every day as well- great relief from lower back pain and good birth prep! I’ve been seeing an Osteopath since I injured my back training last year and I can’t rave about them enough - I’d explain an Osteo treatment as a mix between a chiropractic adjustment, remedial massage and physio. Earlier in my pregnancy I would see my osteo every 3 weeks or so and from 32 weeks I’ve been going weekly to help with back and hip pain and to make sure my pubic symphysis. I feel amazing after I go and I’ve seen a huge improvement and had much less pain since going weekly. I see Kate or Maddie at West Perth Osteopathy and I’d highly recommend them both of them! I’ve had a few pregnancy massages as well which have been heavenly - I went to Comma in Byron Bay on our babymoon and have been to Limon Spa for both their pregnancy treat (massage + pedicure) and pregnancy massage - pure bliss! Pregnancy insomnia has hit me big time in my third trimester and I often wake any time between 1am and 4am for needing the bathroom and then find myself wide awake for a couple of hours. Thankfully I can nap during the day to catch up but I do feel like a zombie some days! I actually found napping during the day helped me sleep better at night as well! Journaling before bed - emptying my mind of things I need to do or any worries or thoughts before bed really helps me sleep well! Even just writing lists helps clear some space. Some nights I wake with something bothering me so I grab my journal and get it out there and then, otherwise I find my night time mind goes around in circles on one rumination. From 37 weeks I started a daily routine to prepare my body, mind and soul for labour which I’ve found to be really supportive and grounding. 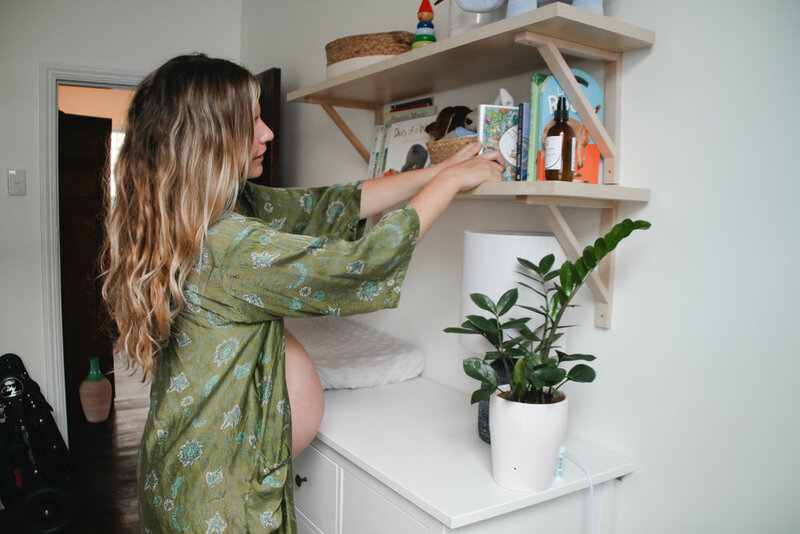 Massage my bump with oil + 1 drop of frankincense essential oil (for skin health, stretch mark prevention and to ground and connect to my body and bub) and 1 drop of clary sage essential oil (to prepare for labour by stimulating endorphins and oxytocin and encouraging contractions). Note: I added the clary sage oil from 38 weeks as it’s known to be quite powerful! From 38 weeks I started hand expressing which was recommended by my midwife as a way to increase milk supply and collect some extra colostrum to have as backup when bub is born. I use the technique from this video and found it was nice and gentle but really effective and I’ve been able to fill lots of 1ml syringes with colostrum - yay! I’ve filmed a nursery tour on my Instagram Stories @amelia_harvey_ which is saved under the ‘Pregnancy’ highlight if you want to have a watch. I go the everything from the nappies we’re using to baby products, clothes, carriers, sleeping arrangements, feeding chair and everything in between!